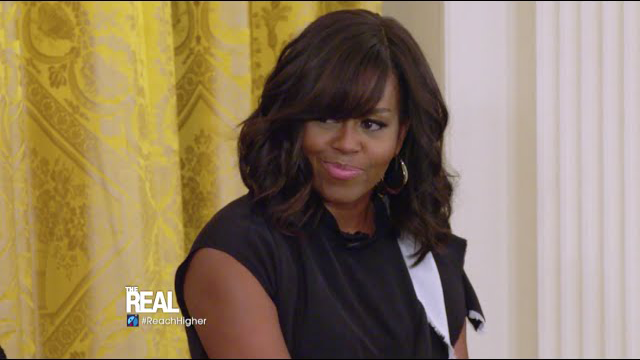 Michelle Obama Keeps It Real On the President, Says He Used to be a "Bum"
Home Michelle Obama president obama The Real Michelle Obama Keeps It Real On the President, Says He Used to be a "Bum"
The ladies of The Real got a special treat when they got to sit down with the First Lady of the United States, Michelle Obama. When the ladies asked her if she or her husband got better grades in high school, Mrs. Obama didn't hesitate in her response. "He will say it's not even close." Mrs. Obama, who attended Princeton and Harvard Law School, got excellent grades. As for her husband, "He was a bum. And it took him a second because he had to grow up a little bit." Even though he "screwed around in high school" as Mrs. Obama says," President Obama found focus a little later. He transferred to Columbia after his second year at Occidental College. He also went on to study at Harvard Law School. She appeared on the show to promote her Reach Higher initiative which encourages students to complete some form of post-secondary education.